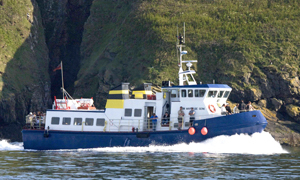 The Isle of Sark Shipping Company Ltd currently owns three passenger vessels plus one cargo vessel. All of our vessels are available for private charter and the company has access to a number of 12 seat high-speed passenger launches which are also available for private charter. For further details about private charters, please contact the Operations Manager by email at info@sarkshipping.gg or by telephoning 01481 724059. Our passenger vessel 'Bon Marin de Serk ' was commissioned by the company in 1982 and has been in operation since 1983. Having a steel mono hull with aluminium superstructure this vessel is powered by two Volvo Penta 700hp diesel engines which give an operating speed of 12 knots. She has a gross tonnage of 118.40, an overall length of 20.6metres, a beam of 6.15metres and carries 131 passengers in the summer and 98 passengers in the winter. 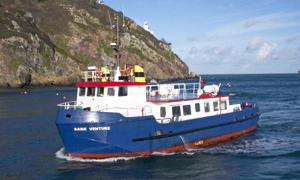 The company’s second passenger vessel is the 'Sark Venture' which was built in 1985 and after being purchased by the Isle of Sark Shipping Company Ltd underwent a complete refit and conversion in 1993. This vessel has a steel hull and superstructure and is powered by two Iveco 450hp diesel engines which give an operating speed of 10 knots. She has a gross tonnage of 133.18, overall length of 20metres and a beam of 6metres. 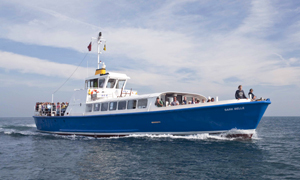 The Sark Venture has a dual role of either passenger vessel carrying 122 passengers in the summer and 92 passengers in the winter, or cargo vessel carrying 32.5tons of freight plus 12 passengers. The Company's third passenger vessel is ‘Sark Belle’. This vessel was built in 1975 and was purchased by the Isle of Sark Shipping Company Ltd in August 2011. She has a steel mono hull and is powered by two Perkins Sabre diesel engines which give an operating speed of 11 knots. She has a gross tonnage of 49.75, an overall length of 21.27metres, a beam of 6.40metres and carries 180 passengers. This vessel operates from April to October inclusive. The Company’s dedicated cargo vessel ‘Sark Viking’ was commissioned by the Company and began services in January 2008. She has a steel hull and is powered by two Iveco 450 hp diesel engines which give an operating speed of 10 knots. She has a gross tonnage of 103.98, an overall length of 21.24metres with a beam of 7.66metres and carries 65 tons of cargo plus 12 fare paying passengers. 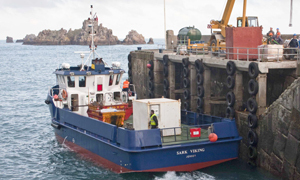 The Sark Viking operates throughout the year and carries approximately 6000 tonnes of freight between Guernsey and Sark each year.